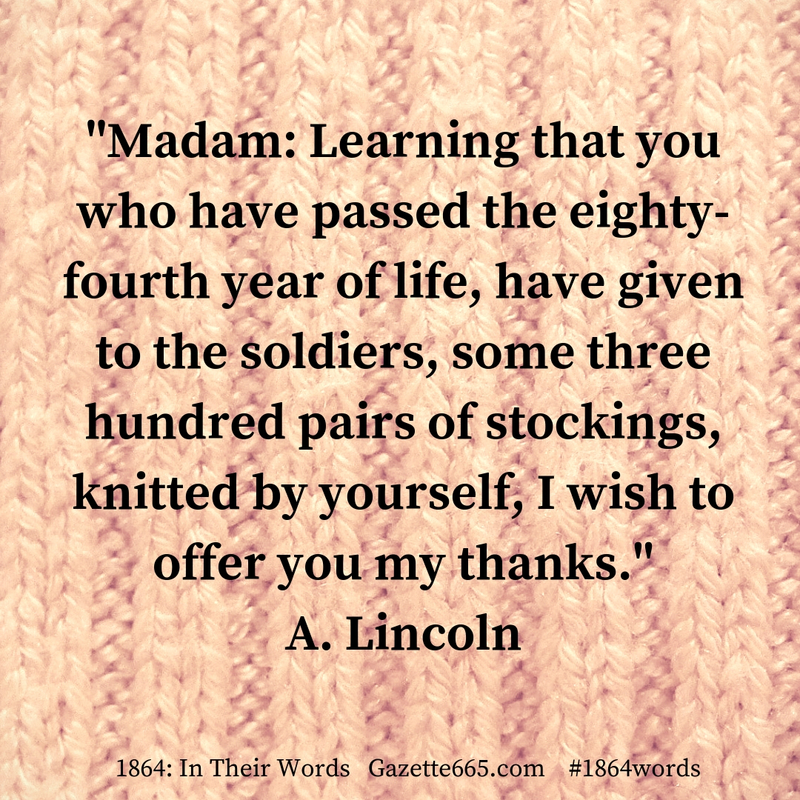 Madam: Learning that you who have passed the eighty-fourth year of life, have given to the soldiers, some three hundred pairs of stockings, knitted by yourself, I wish to offer you my thanks. Will you also convey my thanks to those young ladies who have done so much in feeding our soldiers while passing through your city. To His Excellency, Abraham Lincoln, President of the United States. Letter 1 – Lincoln, Abraham. A. Lincoln: Speeches and Writings, 1859-1865. (published 1989; Library of America.) pages 565-566. Letter 2 – Lincoln, Abraham. Abraham Lincoln papers: Series 1. General Correspondence. -1916: Esther Stockton to Abraham Lincoln, 1864 Reply to Lincoln’s letter of January 8, 1864 . 1864. Manuscript/Mixed Material. https://www.loc.gov/item/mal3509700/. Identifiable images of Mrs. Stockton are not readily available, but it’s easy to imagine her as an energetic, patriotic, older lady – doing her part for the Union war effort. Esther Stockton was born in 1780; that’s one year before Cornwallis’s surrender at Yorktown, to put things in perspective! She lived a “gentle and quiet life” and married Reverend Joseph Stockton. Her husband influenced religious education in western Pennsylvania, founding Meadville Academy (later Allegheny College) and serving as president of University of Pittsburg. Esther’s pride in her children and grandchildren is evidenced in her reply letter to President Lincoln, and she was remembered for her devotion and continual kindness to her family and friends. Happily, Mrs. Stockton lived to see the end of the Civil War. When she died in the late 1860’s at age eighty-seven, having “enjoyed a long life almost without a day’s sickness, retaining in much vigor her senses of sight, hearing and memory.” Her energy and sense of patriotism had prompted her to make a noble contribution to the Union’s war effort – over three hundred pairs of stockings and sending her grandsons into the conflict. 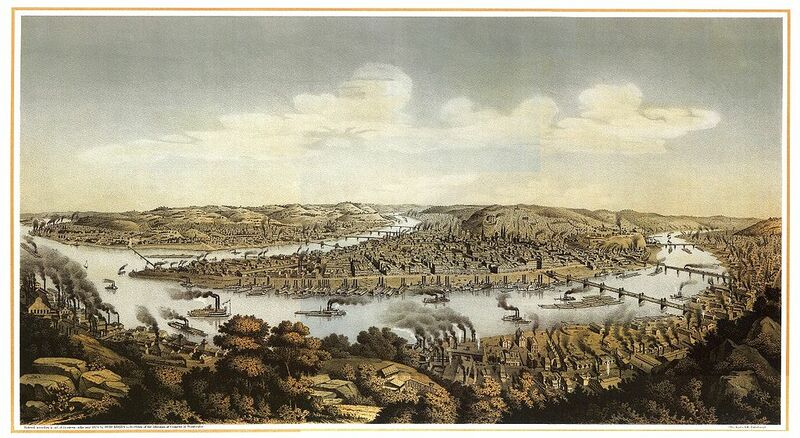 Located at the juncture of the Monongahela, Allegheny, and Ohio Rivers in western Pennsylvania, Pittsburgh had developed into a major industry center by the 1850’s. The rivers and railroads provided transportation connections, allowing the city’s iron and iron products to travel easily to their destinations. During the Civil War, Pittsburgh’s iron works cast some of the largest artillery pieces ever made, up to that time in history. Weapons manufacturing boomed the city’s economy, and iron, steel, and guns created there played a major role in the Union victory. One foundry alone created over 200,000 artillery projectiles and over 1,000 cannons. The Allegheny Arsenal – at its production peak – turned out over 14 million bullets/cartridges per year. Several ironclads were constructed in river-based shipyards. Pittsburgh escaped a direct war experience, though two major Confederate cavalry raids came within a day’s ride of the city. However, due to possible threats during 1863, General William Brooks arrived and prepared city defenses, including several temporary forts. When I saw Lincoln’s letter, I knew it had to go in this series. Then imagine my excitement as I dug a little farther in the online archives and found that Mrs. Stockton had written back to the President – although quite a few months later. I love to knit, and I have this weird thing about looking for references about that handicraft at important moments in history. Knitting makes history! (Can we make that a trending hashtag? I wonder… Probably too many words…) Anyway, I thought it was so terrific that the very busy sixteenth president of the United States took time to write a note of commendation to this elderly matron who had knit over 600 socks already during the war. 300 pairs of stockings is really 600 socks since there’s always two in a pair. 600 divided by 32 = 18.75 socks per month. Which is a little over half a sock per day at that rate! Yeah, I think Mrs. Stockton was busy, and deserves the praise she received. 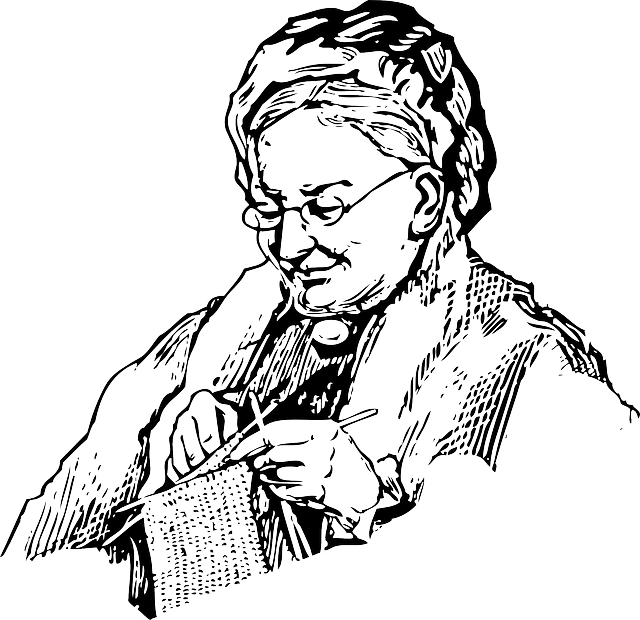 Although she got the letter, there were many other ladies doing the exact same knitting projects across the North (and South). If there’s 1,000 in a regiment going to war, and four regiments in a brigade…ugh…that’s a lot of socks! Your math makes her output very believable. Modern knitters who report on speed seem to think that a single sock can be knit in five to six hours. Still, it’s a great story. I wonder if records of any other prolific wartime knitters have survived? Yes! There are quite a few details about knitting output in journals or other accounts. For some women and homefront communities it became a source of great pride to report how much they had knit or sewn. One notable knitter in the Southern was Mary Lee, wife of Robert E. Lee, and she organized an “knitting brigade” in Richmond.